This is “Using Notes Effectively”, section 14.3 from the book Public Speaking: Practice and Ethics (v. 1.0). For details on it (including licensing), click here. Know how to use notecards to free you from your manuscript. Know how to use notecards to stay organized while you make audience contact. Understand how to develop effective notecards for a speech. It’s a great deal of work to prepare a good speech, and you want to present it effectively so that your audience will benefit as much as possible. We’ve already said that extemporaneous speaking provides the best opportunity for speaker-audience contact and that speaking extemporaneously means you do not have your full manuscript or outline with you. Instead, you will use notecards. The cards should have notes, not the full text of your speech. This can also be done with an autocue device—the TelePrompTer does not have to provide a full word-for-word script. We have developed a system for creating highly effective notecards. Our system has been used effectively both in public speaking courses and in freshman composition courses. Surprisingly, the system consists of only five cards. For many people, this does not sound like nearly enough cards. We would make the case that you can do a good job with five cards, and we have seen many students do just that. Using notes adds to your credibility as a speaker. If you depend on a full manuscript to get through your delivery, your listeners might believe you don’t know the content of your speech. Second, the temptation to read the entire speech directly from a manuscript, even if you’re only carrying it as a safety net, is nearly overwhelming. Third, well-prepared cards are more gracefully handled than sheets of paper, and they don’t rattle if your hands tremble from nervousness. Finally, cards look better than sheets of paper. Five carefully prepared cards, together with practice, will help you more than you might think. Plan on using just five cards, written on one side only. Get 4 × 6 cards. Use one card for the introduction, one card for each of your three main points, and one card for the conclusion. Your cards should include key words and phrases, not full sentences. The words and phrases should be arranged in order so that you can stay organized and avoid forgetting important points. One exception to the key word guideline would be an extended or highly technical quotation from an authoritative source. If it is critically important to present an exact quotation, you may add one additional card that will contain the quotation together with its citation. If you plan to use such a quotation, make sure it has central importance in your speech. Notes are a normal part of giving a presentation. You do not need to conceal them from the audience; in fact, trying to hide and use your notes at the same time tends to be very awkward and distracting. Some instructors recommend that you avoid gesturing with your notes on the grounds that nervous shaking is more noticeable if you are holding your notes in your hand. If this is the case for you, practice gesturing with your free hand, or put your cards down if you need to use both hands. 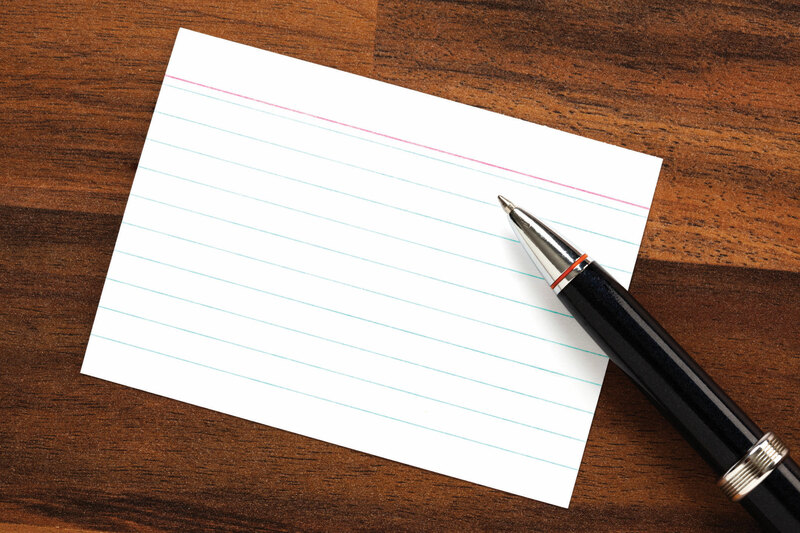 Other instructors recommend treating notecards as a natural extension of your hand, as they believe it is distracting to put your notes down and pick them up again. Whichever “rule” you follow, remember that the goal is for your use of notecards to contribute to your overall appearance of confidence and credibility. The “trick” to selecting the words to write on your cards is to identify the keywords that will trigger a recall sequence. For instance, if the word “Fukushima” brings to mind the nuclear power plant meltdown that followed the earthquake and tsunami that hit Japan in 2011, then that one word on your notecard should propel you through a sizable sequence of points and details. Once you have delivered that material, perhaps you’ll glance at your card again to remind yourself of the key word or phrase that comes next. You must discover what works for you and then select those words that tend to jog your recall. Having identified what works, make a preliminary set of five cards, written on one side only. Number the cards, and practice with them. Revise and refine them the way you would an outline. If you must, rewrite an entire card to make it work better, and test it the next time you practice. Always practice with your notecards—and with any visual aids you plan to use. Practicing is also the best way to find out what kinds of things might go wrong with your notes in the presented speech and what steps you should take to make things go smoothly. You should be able to read something on your card by glancing, not peering at it. A few key words and phrases, written in large, bold print with plenty of white space between them, will help you. If the lighting in your speech location is likely to have glare, be sure to write your notes in ink, as pencil can be hard to read in poor lighting. If you use as much care in developing your five notecards as you do your speech, they should serve you well. If you lose your place or go blank during the speech, you will only need a few seconds to find where you were and get going again. For instance, if you know that you presented the introduction and the first main point, which centers on the Emancipation Proclamation, you can readily go to your second card and remind yourself that your next main point is about the Thirteenth Amendment to the US Constitution. In addition, the use of your notecards allows you to depart from the exact prepared wordings in your manuscript. In your recovery from losing your place, you can transpose a word or phrase to make your recovery graceful. It allows you to avoid feeling pressured to say every single word in your manuscript. Under no circumstances should you ever attempt to put your entire speech on cards in little tiny writing. You will end up reading words to your audience instead of telling them your meaning, and the visual aspect of your speech will be spoiled by your need to squint to read your cards. Good notecards keep you from reading to your audience. Good notecards are carefully based on key words and phrases to promote recall. Good notecards should enhance your relationship with listeners. Using the introduction to your speech, create a 4 × 6 notecard that includes the grabber, the thesis statement, and the preview. Test it by standing as you would during a speech and using it to guide you. Answer these questions: Is it absolutely crucial to utter every word on your outline? Are there some words or phrases that are crucially important? How can you use your notecards to focus on the most important ideas? Select key terms from your speech that you believe will trigger your recall of the sequence of main ideas in your speech. Use them as the basis of your next four notecards. Test the cards by practicing with them to see whether your selected terms are the ones you should use.